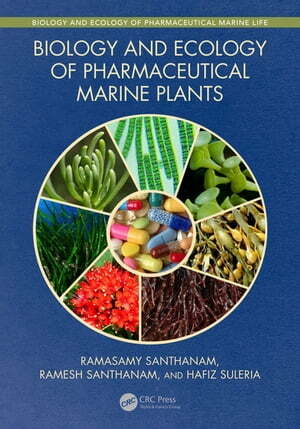 Collins Booksellers - Biology and Ecology of Pharmaceutical Marine Plants by Ramasamy Santhanam, Santhanam Ramesh & Hafiz Ansar Rasul Suleria, 9781351187091. Buy this book online. Marine plants such as algae (blue-green algae and seaweeds), seagrasses, mangrove plants, salt-tolerant or salt-loving plants (halophytes) and coastal sand dune plants are known to generate approximately 70% of oxygen on earth, and help regulate oxygen in the atmosphere. These plants are potential sources of nutrients and are also considered valuable for the development of new drugs owing to their unique bioactive compounds. This book provides the taxonomy, common name, global distribution, habitat, diagnostic features and pharmaceutical compounds (along with their activities) of 400 species of marine plants, accompanied by high quality illustrations. Biology and Ecology of Pharmaceutical Marine Plants is the first comprehensive book of its kind written by scientists from both the Marine Biology and Pharmacy disciplines to fill the long-felt need for a marine natural products book devoted exclusively to plants. It should be a standard reference for students, researchers and teachers of disciplines such as Pharmacy, Fisheries Science, Marine Biology, Life Sciences, Biotechnology and Biochemistry, as well as a valuable guide for pharmaceutical companies involved in the development of new drugs from marine plants.